That aerospace engineering degree that Christina Gebara earned at Georgia Tech in 2017? It's already paid off quite nicely. Not only did it pave the way to a dream job at JPL right after graduation; it earned the 24-year-old Houston native a plane ticket back to Atlanta, where she helped judge the projects of her former classmates in the Space Systems Design competition this week. She was delighted to see old friends, but Gebara greeted her surprised well-wishers with very a polite warning. "Oh, I'm working. I've got a lot to do," she said. "I'm a PI on a project with someone here, so I have a meeting on that. And I'm trying to schedule a workshop on additive manufacturing at JPL later this month.There are a lot of details that I'm trying straighten out with that, too...."
And then there was the Space Systems Design competition - a competition that Gebara, herself, participated in during the spring of 2017. 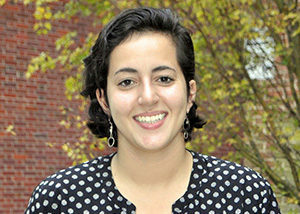 A year later, Gebara was paid to serve as a judge in the competition through JPL' s Center for Academic Partnerships. She said she was very honored to be chosen as a judge, but she had no interest in talking about the honor part. She wanted to talk engineering. "Yeah, when we did this, our project was a design for a cubesat that was supposed to go to Phobos, a moon of Mars," she said. "We were more constrained than the projects I saw this week. We only had $5 million to do an interplanetary probe. They had something like $350 million. It was definitely a challenge, too, because with a conceptual mission, you always risk getting too detailed -- and wasting your time - or not understanding the relevant aspects of your mission. Different projects, but the same challenge." Her love of challenges has served Gebara well over the last nine months at JPL, where she has worked as a mechanical engineer in Payload and Small Spacecraft section of the Advanced Deployable Structures group. 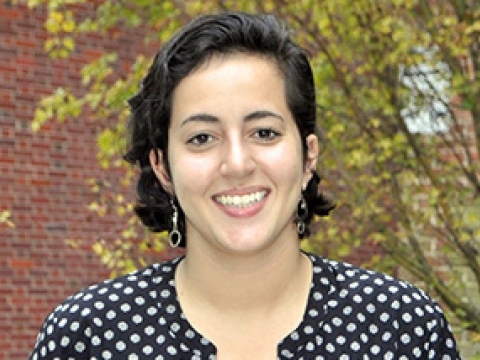 Though she had interned a total of about a year at the Pasadena lab as a GT-AE undergraduate, the responsibility of working there full time gave her pause. "The roles of an intern and a full-time engineer are different," she said. "I felt well-prepared from my internships and from my work at Tech, but the fact is I needed to begin establishing myself as a technically sound engineer. I've been doing that by getting involved in three main missions - and a few side projects that I get to tinker with." PSYCHE: A mission to a unique metal astroid that appears to be made of the exposed nickel iron core of an early planet. Gebara waves off excessive interest in these projects. The descriptions sound almost science-fictiony to an untrained ear. She knows better. "I'm still learning with all of them, and things are always changing," she says. "I've been given an opportunity to see how JPL views the big picture, and that informs how I pursue my little piece of the big picture. It's great." Turning back to the Space Systems Design competition, where she reviewed seven projects, Gebara says she got some insight that she'll bring back to work. "What they did this week is very similar to what happens at JPL with a technical review," she says. "I haven't had one at JPL yet, but I've got one next week." 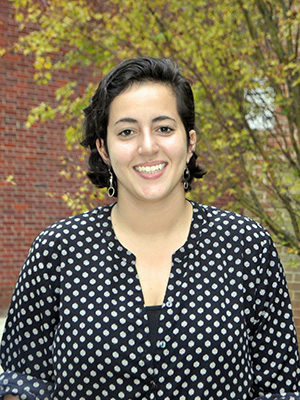 Christine Gebara has enrolled in the Daniel Guggenheim School's M.S. program as a distance learner. Continuing the Tradition. 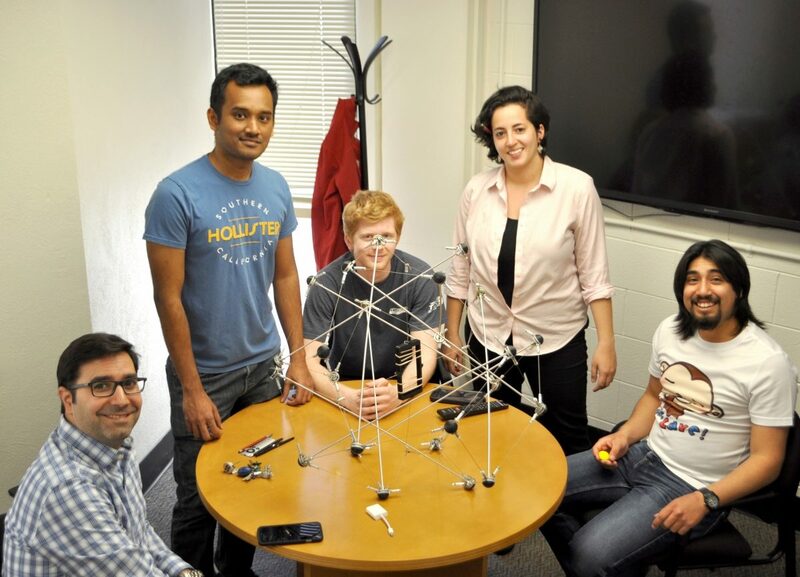 As an undergraduate, Gebara often worked on tensegrity projects with Prof. Julian Rimoli (far left). The two are continuing that collaboration now that Gebara is working across the country at JPL.